Parad Shivling when worshipped with proper procedure, belief, and enthusiasm helps human beings physically, spiritually, and psychologically. Also protects people from natural calamities, disaster, external evil effects. Some of the reference in the ancient texts of Ayurveda and mythological origins which justifies these belief are as follows. It is stated and believed in various texts that if a mercury Shivling is placed and worshipped in a house, society, or a temple. It is considered that it leads to prosperity, positive strength, and also considered that goddess Lakshmi resides at that place for generations to generation. Also a person is relieved of physical ,spiritual, psychological disorders. Mercury Shivling can be obtained only through the blessings of renowned yogi ,guru, good fortune, because of which a person is able to perform noble deeds and therby attains moksha. The holiness, auspiciousness acquired by the sight and worship of purified Parad Shivling is crore times more then that of lakh of other Shivling. As just the sight of Parad Shivling neutralises an individual from dreadfull sins like thousands of Brahmahatya, Cow Slaughter and on touching Parad Shivling person is completely relieved of all these sins as quoted by Lord Shiva himself. According to Ras Ratna Samuuchayy, it is consideresd that Shivling made of pure mercury is unique which leads to longetivity of life, prosperity, also washes away the sins from (ones) life. Holy blessing which is obtain by performing 100 Ashwamegh Yagya, donating Lakhs of cows, donating ample of gold, and taking holy bath in all the four pilgrimage places (Char Dham) is equal to the sight (Darshan) of holy Parad Shivling. People who worship Parad Shivling with all the good virtues, attain the blessings of Shivling present in all the 3 Loka's (Swarga Lok) and also destroys all bad sins. Mercury Shivling is considered the best to attain success and progress in today's world one can buy everything with money but purified Mercury Shivling (Yantrasiddha and Pranpratishtha Yukta) is possessed by only few lucky people. All Mahatmas, Sadhus of the world have stated that people who have worshipped pure Parad Shivling or even have got an opportunity to touch it are the luckiest as they get Bhautik (Spiritual) happiness along with Jeevan Mukti (Salvation). That is the reason why wealthy people, Sadhu Sanyasi (Saints), Politicians, Film Personalities, Brahmins try to obtain pure Mercury Shivling. states that the person who worships paradshivling at home is freed from all the sins and attains eternal happiness along with the blessings of shivlings present in all the three loka. It states that Ravan was a Rassiddha Yogi, and hence he used to worship Parad Shivling through which he was able to make Lord Shiva happy, and through which he was able to make his kingdom of gold. Similarly Banasur (Rakshas) also worshipped Parad Shivling and attained his desired wishes. It states that Parad Shivling is Maha-Linga, also it is home to Lord Shiva's divine powers hence called "Shivalaya". It's attainment leads to prosperity and success. It states that Lord Siva had told to goddess Parvati that a person who worships Parad Shivling. Fear and death cannot come closer to that person, also poverty never resides at their place. It states that people of all the 4 categories according to Hindu Religion (Namely Brahmin, Kshatriya, Vaishya, Shudras) and even females can worship and attain blessings of Parad Shivling. It states that till the time there is existence of moon and the sun in the universe, till that time a person who worships Parad Shivling gets all its benefits in the form of wealth, prosperity, success, honour, respect,offsprings, intelligence which leads to the completion of satisfactory lifespan and attain moksha. It states that people who slaughter cow, malign others, veerghati, Who influence abortion, who trouble their parents the sins of such people can also be washed away by only the sight of Parad Shivling. It states that healthy body, longeitivity of life, prosperity and all other wishes of a person can be fulfilled by worshipping Parad Shivling. It states about the importance and usefullness of pure Parad Shivling, in a form where spiritual powers like (Anima, Mahima, Garima, Ladhima, Prapti, Prakanta, Proshatva, Vishitwa), Ashta Siddhis like Simha, Vrushya, Hathi, Kalasha, Pankha, Vaijayanti, Bheri, Deepak) or (Brahmin, Cow, Agni, Gold, Tupa (Ghee), Sun, Water, King), Kubers 9 Wealth (Padma, Mahapadma, Shankha, Makar, Kachap, Mukund, Kunda, Neel, Kharva) all the holiness of the above mentioned Shaktis and Siddhis are present in Parad Shivling itself. It states that the way an individual feels eternal happiness, satisfaction after worshipping their Lord, an aura of the Lord due to which various disorders are cured similar kind of an experience is felt by just the sight of Parad Shivling. It further states that such an Amrutmayi (Nectar like), Sudhasiddha (Purified) object should be worshipped. It further explains that worshipping Parad Shivling leads to eternal peace and happiness (i.e. A person is relieved from material things like Birth, Death, Oldage, Weakness, Pain of dreadfull bodily diseases. Further it explains that Para (Mercury) is a by product out of conception of Lord Shiva and Goddess Parvati, hence in different forms it relieves human beings of their physical, spiritual, psychological disorders. It states that a person who worshipps Parad Shivling, aquires all the four Purusharthas (4 vital parts of life ), those are Dharma (Noble Deeds), Artha (prosperity), Kama( Sexual Desires), Moksha (Eternal Peace, Salvation). Further importance of Shivling is explained in a way that happiness, Prosperity (Punya) obtained by just the sight of a purified Parad Shivling is crore times more then worshipping thousands of renowned Shivling. It explains that worshipping a Shivling made of gold gives Punya million times more then worshipping Shivling made of stone. Similarly worshipping Shivling made of mani( Gemstones i.e. 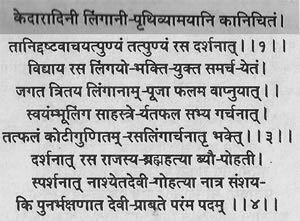 Manibaddha gives Punya million times more then the Shivling made of gold. Further it explains that worshipping Shivling of Banlinga Narmadeshwar gives million times more Punya then worshipping Manibaddha Shivling. At the end it states that worshipping a purified auspicious Parad Shivling gives million times more Punya then even the Shivling at Banlinga Narmadeshwar. Thus it is clear that out of all the Shivling made of different materials and pilgrimage sites, one made of purified Para (Mercury) is considered above par (excellent).